Nearly 100 CTA members came to the CTA Chico office today to fill out CTA Disaster Relief grant forms. It's the first time many colleagues have seen each other since the Camp Fire broke out, literally burning the town of Paradise to the ground. Child care was provided while parents did paperwork, and every child left with a book or coloring book. After filling out the forms, each member was given a CTA goodie bag containing gift cards, hand sanitizers, lotions, first aid kits and toothbrushes. Members say they are grateful for the support and resources provided by CTA. "Teachers are so appreciative of the opportunity to come in, ask questions and apply for CTA resources," said TAP's Smith. "They're feeling more secure leaving the building than when they came in. We can't give them guarantees, but I can share with them what CTA and the district are doing. They find it reassuring." 63 D E C E M B E R 2 018 / J A N U A R Y 2 019 How to Help F O R M E M B E R S and communities affected by the many wildfires and other disasters, the best form of aid is cash assistance. If you can, donate to the funds listed here so local folks on the ground can purchase the items they need: • The Chico Unified Teachers Association's Camp Fire GoFundMe fundraiser for educators and students in the Paradise/Chico area, gofundme.com/camp-fire-paradise-teachers. • Butte College Education Association has set up two GoFundMe fundraisers — one for faculty, gofundme.com/ butte-college-facultystaff-relief, and one for students, gofundme.com/ butte-college-student-relief-fund. • Santa Monica-Malibu educators GoFundMe fundraiser, gofundme.com/smmcta-fire-victims. • The CTA Chico RRC is also accepting donations of cash and practical gift cards for groceries or essentials. If you can provide housing, for those needing a place to stay, please call the RRC at 530-345-9743. 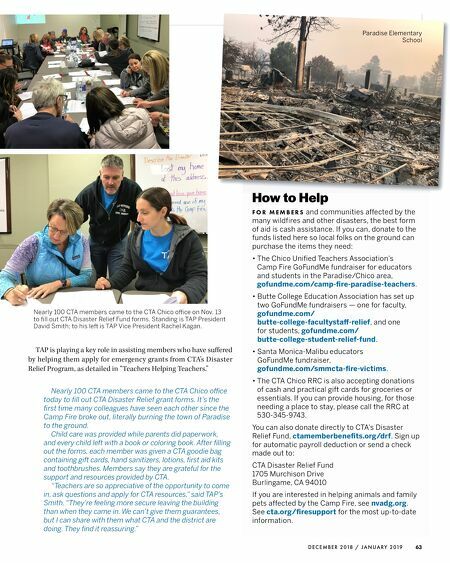 You can also donate directly to CTA's Disaster Relief Fund, ctamemberbenefits.org/drf. Sign up for automatic payroll deduction or send a check made out to: CTA Disaster Relief Fund 1705 Murchison Drive Burlingame, CA 94010 If you are interested in helping animals and family pets affected by the Camp Fire, see nvadg.org. See cta.org/firesupport for the most up-to-date information. 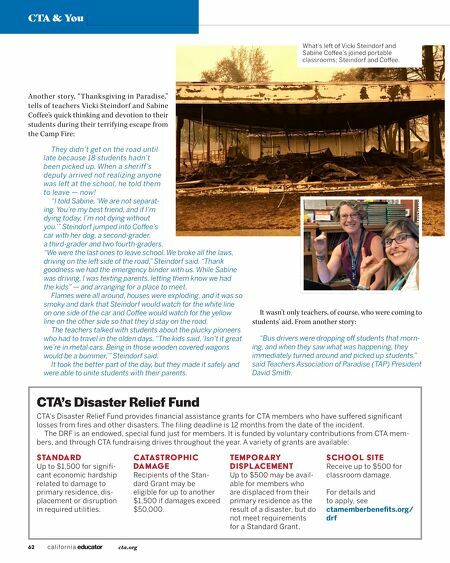 How to Help Paradise Elementary School TAP is playing a key role in assisting members who have suffered by helping them apply for emergency grants from CTA's Disaster Relief Program, as detailed in "Teachers Helping Teachers." Nearly 100 CTA members came to the CTA Chico office on Nov. 13 to fill out CTA Disaster Relief Fund forms. Standing is TAP President David Smith; to his left is TAP Vice President Rachel Kagan.